Goodbye to 2017 and this Blog. Hello to 2018 and less Negativity. When I started this blog a little more than four years ago, I was living in Virginia and yearning to return home. A year later, I was happy to be back in Michigan, and I have spent the last three years exploring more of our state than I ever had before. There is so much natural beauty to behold here and many good people to meet. 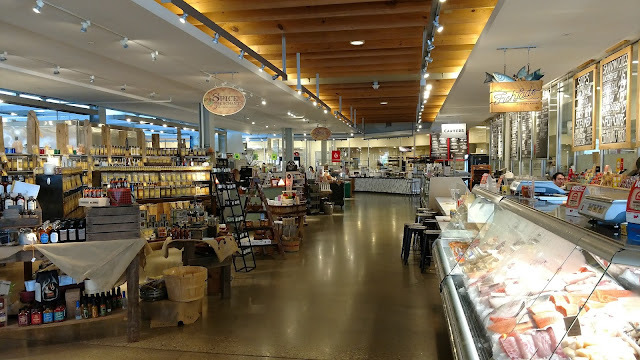 With Michigan's distilleries, breweries, and restaurants, my taste buds were never bored, and my stomach was rarely empty. 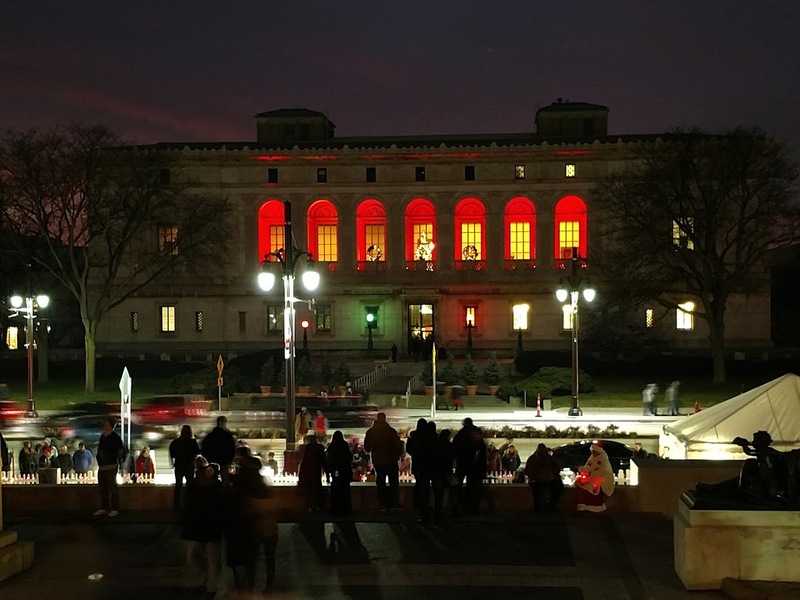 Our cities and towns are filled with architectural wonders and world-class museums. Our history includes Native Americans, French fur traders, the Underground Railroad, British forts, and the Arsenal of Democracy. There is much to be proud of and to love about our Great Lakes State. However, there is a dark side to our society, both in Michigan and throughout our nation. And that dark side breeds on the internet in comments sections and social media. Twitter has become unreadable to me. It's just a place for people to shout over each other. The cacophony has made us both angry and deaf. For someone who likes to read thoughtful and informative prose, seeing arguments reduced to ignorant memes and name calling is disheartening. Seeing violent acts committed as a result of Twitter fights and hateful propaganda is heartbreaking. In this climate, writing positive posts has become too difficult for me. I've also made some other changes in my life that frankly leave me with less time to write. I'd rather spend my free time with my wife, Allison, and two daughters than trying to come up with new things to write. I will continue to travel throughout our great state, and I'll talk to people more. This is my last blog post, but my blog will be up for some time for anyone who wants to read old posts. I'm shutting down my Twitter and Facebook pages in a few days. A conversation can tell me a lot more about a person's character than 280 characters ever will. With that said, here's to a wonderful 2018 and beyond. Thank you to the very few loyal readers I've had for your comments and support. Thanks to the few guest writers I've had. You added different voices to this blog that I appreciated. And most of all, thanks to Allison for being my editor and biggest supporter. I finally went on Pure Detroit's Guardian Building Tour a few weeks ago. I highly recommend this tour. Our guide was a history student at Wayne State, and he gave a great tour that included the history of the building and the city, and background about the architect and the materials used to construct the building. It's a gorgeous building with great views of the city. One last thing: Don't forget to tip your tour guide. Anyway, until the shooting happened, this event was everything I love about Detroit. The Midtown museums were open to the public, and people of diverse backgrounds happily wandered the streets. The highlight was seeing the Mosaic Youth Theatre perform at the Charles Wright Museum. The kids in this theater group were incredibly entertaining. My five-year-old daughter was on the edge of her seat, smiling and clapping at everything these young performers did. I hope to see them again soon. Before Noel Night, my family and I visited the Detroit Urban Craft Fair at the Masonic Temple. I am not a craft person, but there was a lot of really cool art depicting Detroit. I didn't buy anything, but Allison did. It was heartening to be in a crowded space full of artistic people who are proud of Detroit. I visited Ann Arbor's Kerrytown Bookfest for the first time this year. It is a great event for readers of all ages. Several Michigan authors were present to sign books and give readings. There were tons of kids' books features, which our daughters loved. There were a couple of letterpress companies giving demonstrations, and one even allowed our daughters to use the small press. 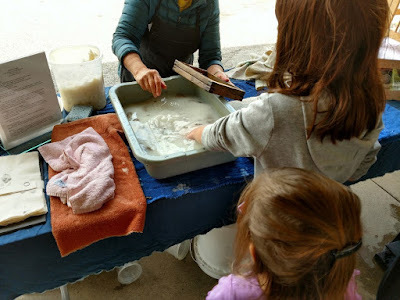 We also got to make paper. Detroit's Kuzzo's Chicken and Waffles is damn good. I of course had to try chicken and waffles, and they were outstanding. I've only been once, but I definitely will return, because I love southern comfort food, and Kuzzo's serves some of the best. I was able to try a few new breweries this year, and all were satisfying. I visited Grand River Brewery in Jackson with Allison after running a nearby half marathon. Disclosure: The owner of this brewery is a cousin of mine, but I wouldn't let that influence my opinion (if I didn't like it, I wouldn't write about it). The brewery has a pretty big menu, but I could smell meat on the smoker when we walked up to the restaurant. I had to try the beef brisket, and it did not disappoint. 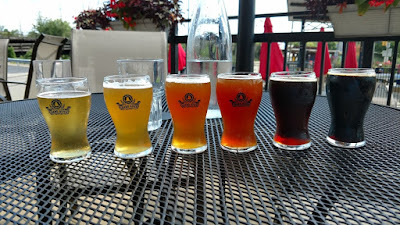 I also had an excellent flight of beer. I also enjoyed my visits to Royal Oak's ROAK Brewing, Black Lotus in Clawson, and Fillmore 13 in Pontiac (I also love seeing some of the revitalization efforts in Pontiac. It has so many beautiful buildings.). They all poured good beer and served tasty food. I've compiled a few Michigan reading lists over the years. Since last summer's list, I've read a few more books by Michigan writers that I found noteworthy. The top of the list is The Undertaking: Life Studies from the Dismal Trade, by Thomas Lynch. Lynch's book explores questions of life and death, but often with an irreverence and humor that make these questions more palatable. I finally read The Virgin Suicides by Jeffrey Eugenides after seeing the movie a few times. The movie is pretty true to the book, but I enjoyed the book more. It gives more of a feel of what living in Grosse Pointe and Metro Detroit was like back in the 1970s. I've heard a lot of good things about Bonnie Jo Campbell, so I read her novel Once Upon a River. 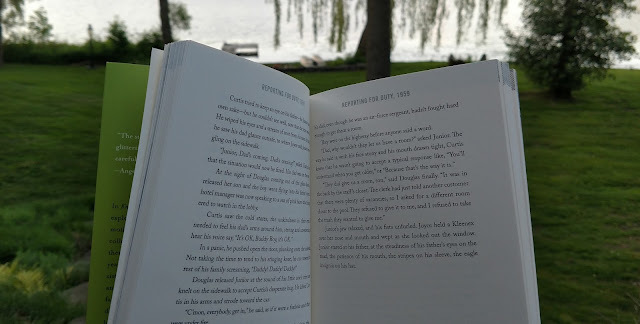 The novel is set in western Michigan and follows a young woman's journey to find herself after experiencing several family tragedies and traumas. It's an intense book, and some of the traumatic parts were hard to read, but only due to the high quality of Campbell's writing. Last, but not least, is Adam Schuitema's The Things We Do That Make No Sense. This Michigan writer's collection of short stories presents quick, but real, snapshots of life that I found relatable and engaging. Leland is one of those towns that I always wanted to visit. We made a quick detour there on the way home from Traverse City this past summer. 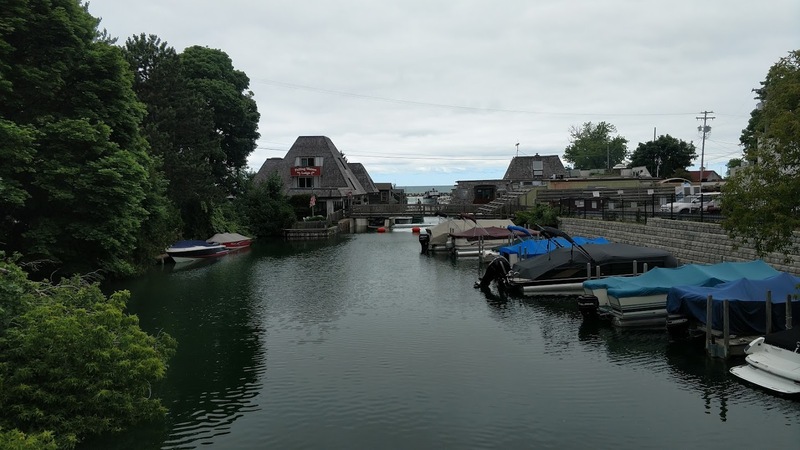 Unfortunately, it was a rainy and cool day, so we didn't explore as much as we would have liked, but we did enjoy walking around the old fishing village and visiting a couple bookshops. I would like to visit again, but with more cooperative weather. Unlike me, Allison is an actual, professional writer. She had an assignment to write about things to do and see in the Thumb. I tagged along and was thinking about writing something, but it wouldn't have compared to her article, which you can read here. Except for the cold and rainy weather, we had a lot of fun. 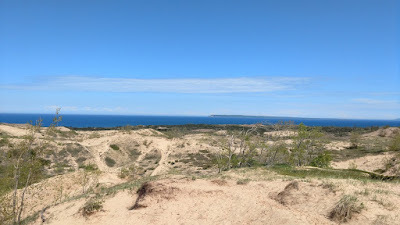 Confession: Despite growing up in Michigan, I visited the dunes for the first time ever over Memorial Day weekend. Having run the Bayshore Marathon two days before, my legs were aching from 26.2 miles of pounding on asphalt. The dunes deceived me because every time I reached the "top," I realized there was another top in the distance. 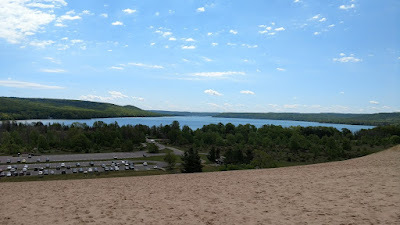 The first "top" gives a majestic view inland of Glen Lake, but I wanted to see Lake Michigan, so I punished my aching legs and continued on, trying to keep up with my daughters sprinting up the sand. I don't know how many peaks I reached only to see another one taunting me. It must have been two or three, but each view was worth the climb. My sore legs slowed me down, but they forced me to spend more time enjoying the views and the cool spring air blowing in from Lake Michigan. When we finally reached the bluff that gave us a view of Lake Michigan, I was overcome by dunes' and lake's imposing grandeur. I felt humbled and grateful to live in a state with so many natural wonders, and I still do. Thank you again for reading. Godspeed! Despite being born and raised in the Detroit area, I somehow never visited Grand Rapids before. I didn't have anything against Grand Rapids. Instead, I found it too easy to keep visiting the places in Michigan that I already knew. I have been wanting to visit for some time, and my work luckily took me to Grand Rapids on Monday. Since I had a meeting at 1 p.m. downtown, I left my home early enough so I could have two meals and see as much of the city as possible during my visit. 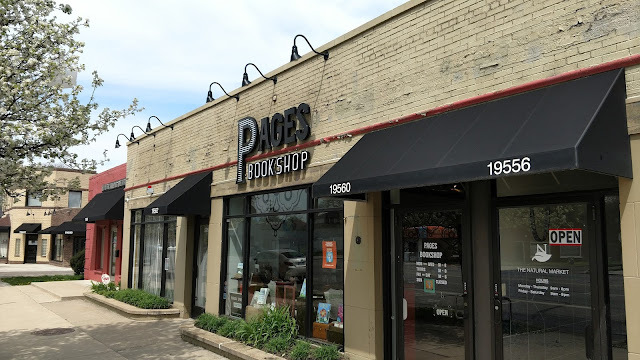 Besides tasting a new city's food and beer, I always try to visit its independent bookstores, so my first stop was Argos Book Shop in the Eastown neighborhood. Argos specializes in used books, and it has a comic book section that looked impressive to this non-collector. 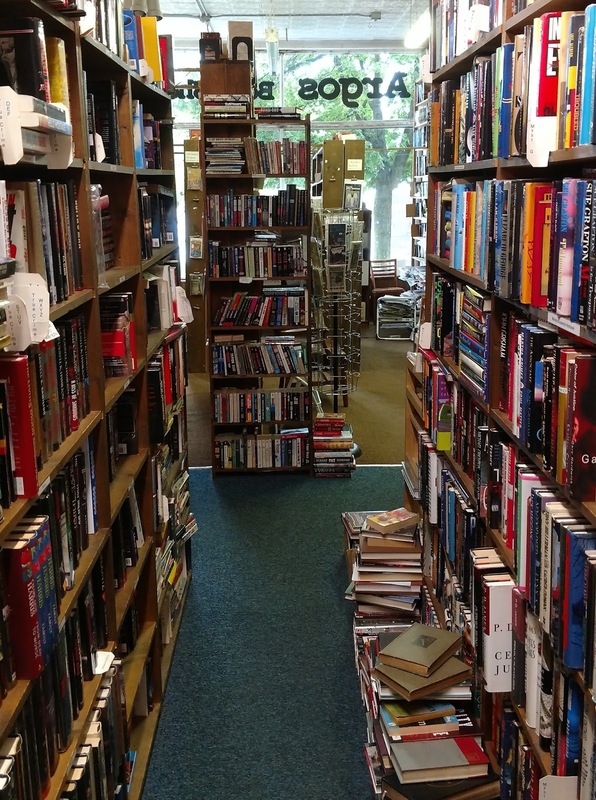 The store has two rooms full of used books covering many genres. I could have spent more than an hour searching the shelves, but I had to eat lunch before my meeting. 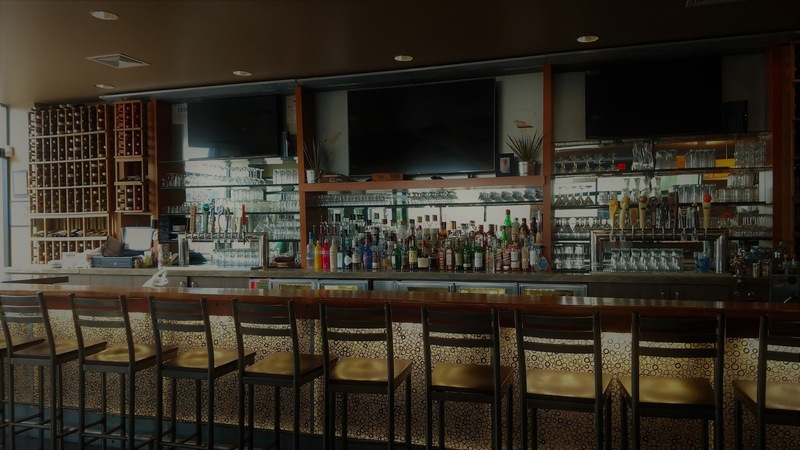 For lunch, I chose The Green Well Gastropub in the East Hills neighborhood. The neighborhood was quiet because it was 11 on Monday morning, but I'm guessing it is bustling later in the day since it features several shops and restaurants, and one of Grand Rapids' many breweries, Brewery Vivant. My family and I spent Memorial Day weekend in Traverse City because I had the crazy idea to run the Bayshore Marathon. 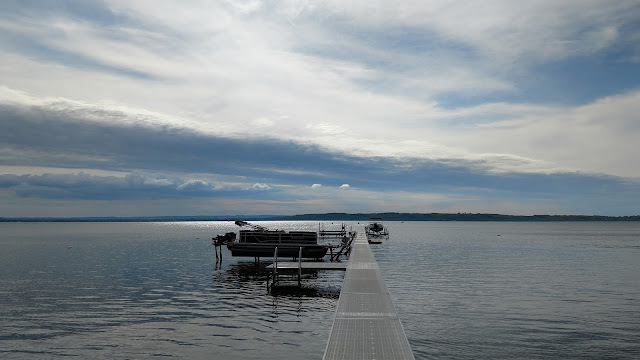 We rented a great condo at the Shores condominiums in Acme, on the east side of East Grand Traverse Bay. The Shores's beach has a beautiful view of the bay and Old Mission Peninsula. We stayed in on Friday night, since I had to wake up early for the marathon. 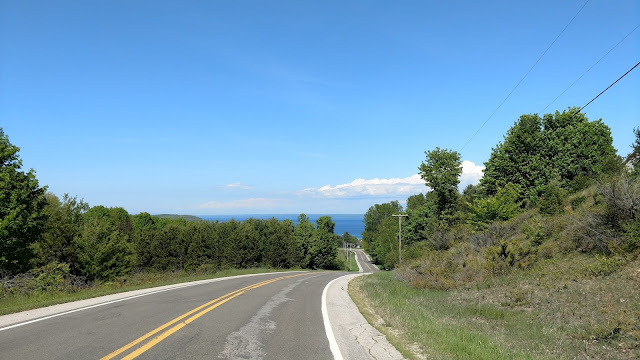 On Saturday afternoon, after a few hours of post-marathon recovery, we drove up the eastern shore of the Old Mission Peninsula, so I could show my wife and kids the views I saw while running. 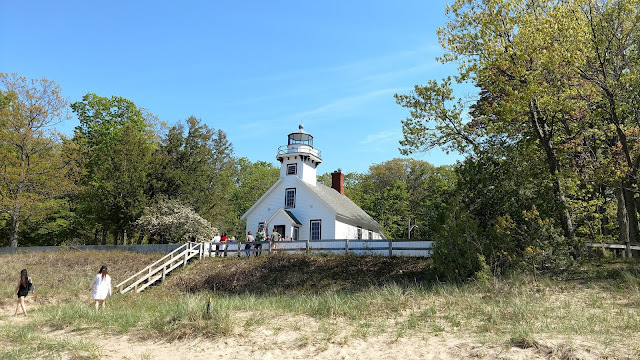 The drive was so relaxing that we ended up driving to the northern tip of the peninsula and visited the Mission Point Lighthouse and beach. The tip of the Old Mission Peninsula is on the 45th parallel, meaning we were standing halfway between the equator and the North Pole. We would have explored the lighthouse and beach more, but there were a lot of bugs out, and my four-year-old daughter was not happy that bugs kept landing on her. I also was exhausted and wanted to eat, so we just took a few photos of the lighthouse and the beach. 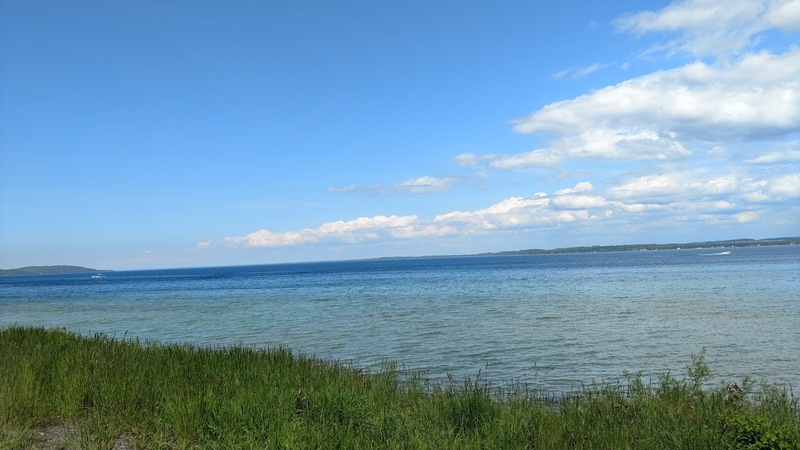 We drove back down the western shore of the peninsula toward downtown Traverse City. We went to Apache Trout Grill for dinner because several people recommended it. There was supposed to be an hour wait, but fortune intervened and a table in the bar area opened up after only about 5 minutes. Yesterday, I ran my fourth marathon, the Bayshore Marathon in Traverse City. I have run two Marine Corps Marathons in DC and the Capital City River Run in Lansing. The Bayshore is by far my favorite, and not just because I set a PR (more on that later). From the volunteers to the spectators to the Moomers ice cream at the finish, everything was well run. But the highlight is the course itself. 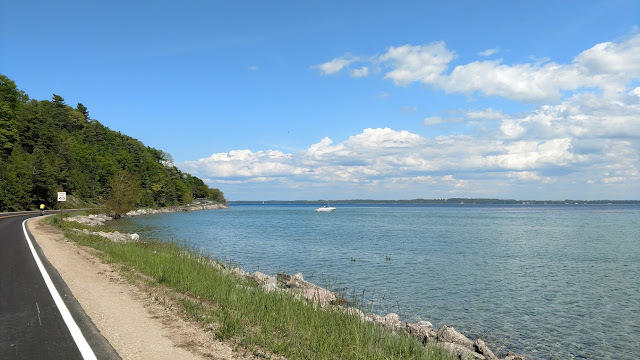 For almost the entire 26.2 miles, the course follows the roads along the eastern shore of the Old Mission Peninsula. The route gives runners sweeping views of the blue waters of East Grand Traverse Bay. My description of the views cannot do them justice. My family and I drove along the course several hours after the race so I could show them what I saw, and so I could take a few photos. If you have to run 26.2 miles, might as well enjoy the view. The course is mostly flat, but there were a few small hills here and there (the only ones I really noticed were in the last 5 miles, when I was struggling to keep my legs moving). Many of the residents along the route sat in their front yards and cheered the runners on, and some even offered water (or beer. . . I passed on the beer). Olympic marathoner Desi Linden, one of the fastest women in the world, even stood on the sidelines encouraging people who run the marathon hours slower than her. My favorite indie bookstore from childhood died more than 20 years ago at the hands of Barnes & Noble (which moved in across the street), but that same Barnes & Noble perished recently, most likely because it couldn't keep up with Amazon. It's been a common trend over the last 30 years. Big bookseller moves into the neighborhood, forcing an independent store to close, and then the big guy shutters its store when it can't compete with online shopping. Luckily for those who love independent bookstores, some indies have survived the decades-long assault from big booksellers and the internet, while others have recently opened up shop. Whether they opened in the last few years or more than a few decades ago, good independent bookstores realize that they are much more than stores that sell books. It doesn't matter whether they sell coffee and other merchandise or just books. The special ones are gathering places for readers and writers. They offer recommendations, spur conversation, preserve and promote knowledge, and elevate communities. 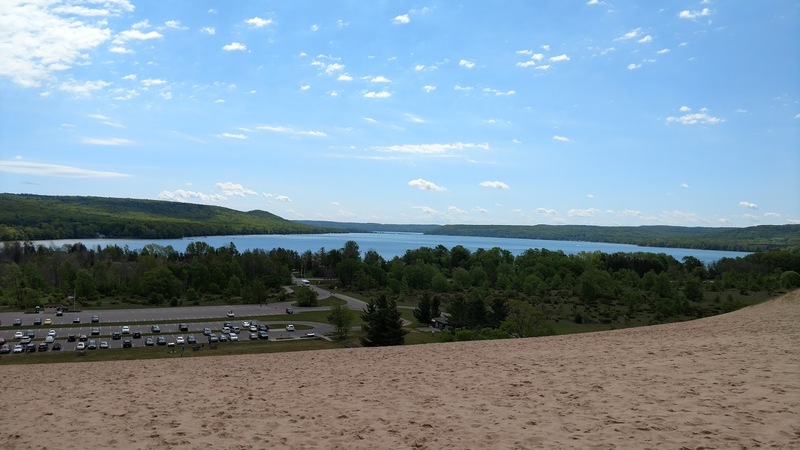 Munising is a city of just more than 2,000 people on the western edge of the Pictured Rocks National Lakeshore. Most visitors know it as the place to hop on one of the Pictured Rocks cruises, but Munising also has a top-notch bookstore in Falling Rock Cafe & Bookstore. The cafe serves custom-roasted coffee, breakfast, and sandwiches. The bookstore has more than 30,000 new and used books, as well as locally made jewelry, pottery, and gifts. 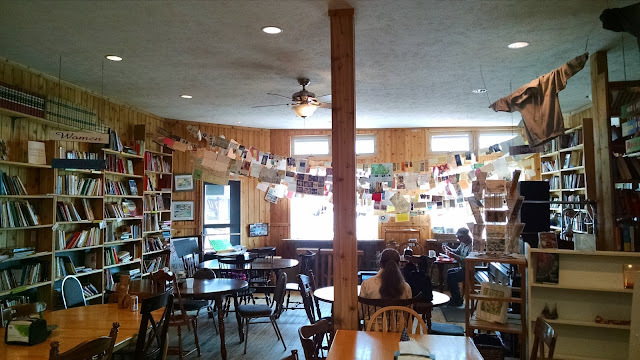 I was impressed by their section dedicated to local writers and found a couple of great books set in the U.P., South of Superior and Here. With its wide-open floor plan and numerous tables, Falling Rock is a great place to warm up with a good book and cup of coffee on a cold U.P. day. Labels: Ann Arbor, Books, Detroit, Marquette, Metro Detroit, Munising, Oakland County, The U.P. As a teenager, I saw a handful of movies at the Redford Theatre in Detroit--classics like The African Queen, On the Town, and Shane. Everything about the Redford felt historic, from the organ to the interior architecture to the way they showed Warner Brothers cartoons before the feature and always had an intermission when we could refill our pop and grab more snacks without missing any of the action. I remembered how, once the lights dimmed, the sky-blue ceiling shone with hundreds of tiny lights, giving the audience the feeling that it was watching a movie under the stars. Until Saturday, it had been a couple of decades since I visited the theater, so my memory was a little fuzzy about the building's architecture. Regardless, I was excited to bring my wife and two girls to the theater. The Redford was showing Harry Potter and the Sorcerer's Stone, and my daughters were excited to see it for the first time in a movie theater. 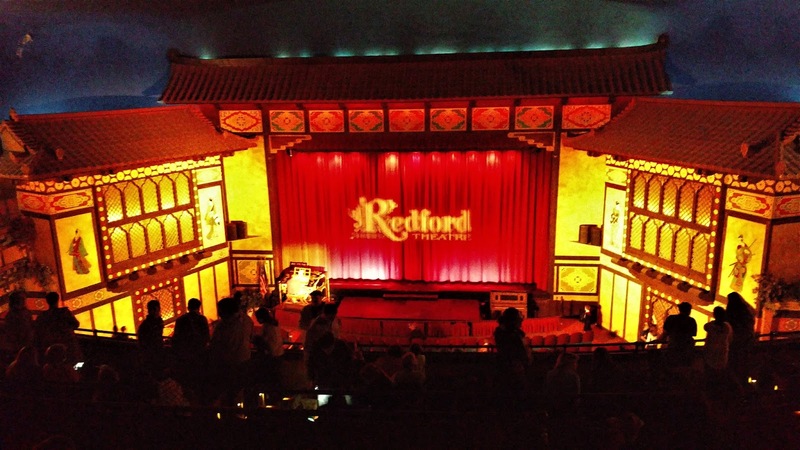 The theater's yellow-trimmed marquee is not as imposing or ornate as those of other old movie houses in Michigan, which only makes the inside of the Redford Theatre more impressive. When the theater first opened in 1928, it had a larger marquee, but it was later replaced. Part of it was used for scrap metal during World War II, not the only change brought on by the war. 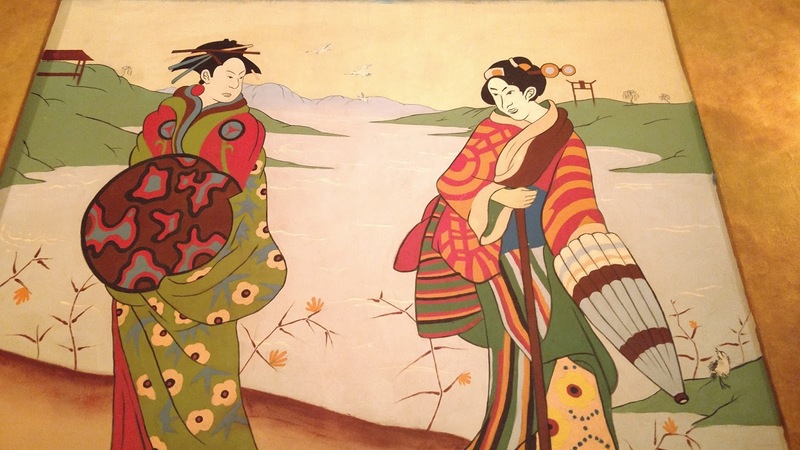 The theater's original Japanese-themed interior was removed or painted over after Pearl Harbor, and much of it was still hidden when I last visited in the early 1990s. On Saturday afternoon, I had the opportunity to attend a poetry reading in Detroit presented by Lynch and Sons Fund for the Arts and Wayne State University Press. 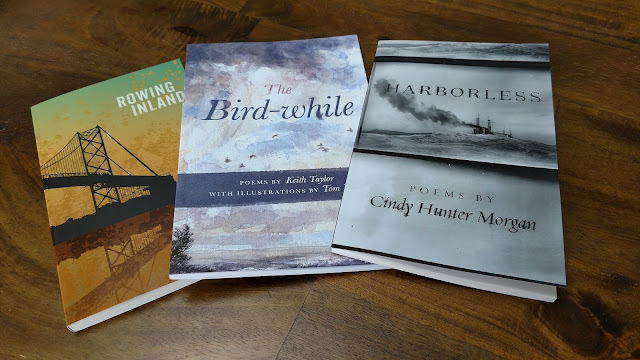 The event featured three poets, Keith Taylor, Cindy Morgan Hunter, and Jim Daniels, reading from their newest collections of poetry. Each collection was published through Wayne State's Made in Michigan Writers Series, which publishes poetry, essays, creative nonfiction, and short fiction by Michigan writers. 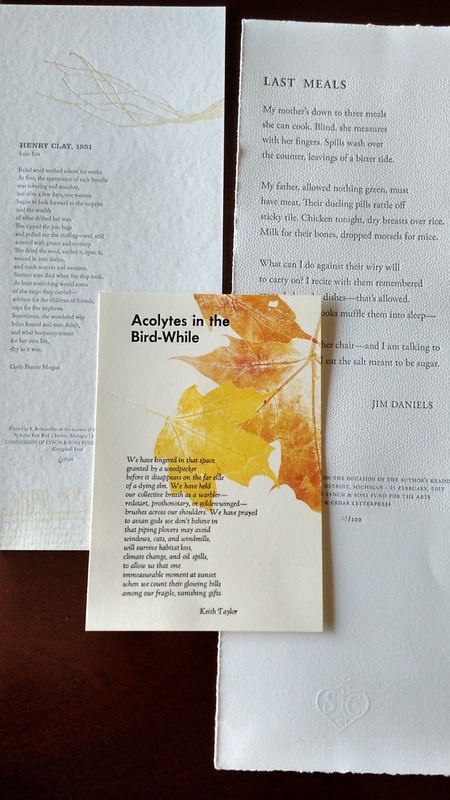 Keith Taylor has published several poetry collections and teaches creative writing at the University of Michigan. He read from his newest collection of poetry, The Bird-While. Before reading his poems, he explained that he borrowed the title of his collection from Ralph Waldo Emerson. Emerson described a "bird-while" as "the space most of the wild birds will allow you to make your observations on them when they alight near you in the woods." Each of the poems Taylor read is a brief, but thorough, view of both human nature and actual nature. 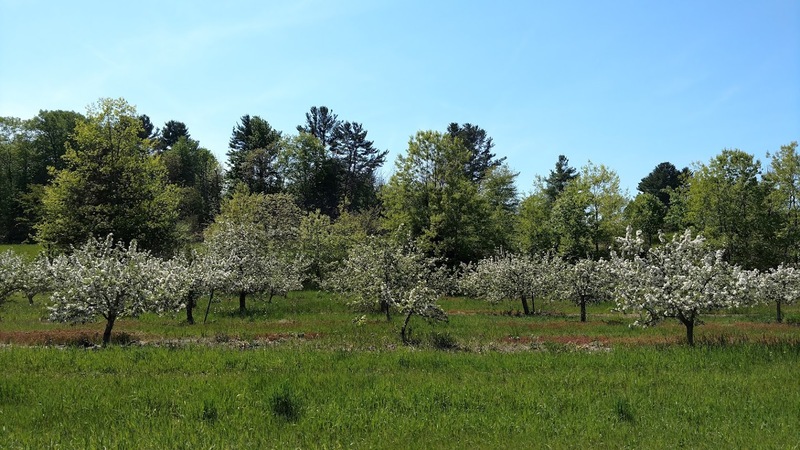 He read about his daughter's narcolepsy, a hummingbird that stops its work to watch a jet fly overhead, young scientists talking about life as information, and the day the trees in his yard were uprooted by a storm. Cindy Hunter Morgan is a native Michigander who teaches creative writing at Michigan State University and has authored two award-winning chapbooks. Hunter Morgan read from Harborless, her collection of poems about Great Lakes shipwrecks. The Great Lakes are the resting grounds for more than 6,000 shipwrecks and 30,000 mariners, and Hunter Morgan gives a humanizing glimpse into what might have been the final moments of more than thirty of these wrecks. Before reading each poem, Hunter Morgan gave a brief history of the shipwreck itself. One ship caught fire carrying a cargo of peaches, and Hunter Morgan captures the smells, sights, and sounds of a ship full of peaches going up in flames. Another ship carried Christmas trees from the Upper Peninsula to Chicago, where families waited at the docks to purchase trees that never arrived. Hunter Morgan used the pantoum poetic form for this Christmas tree ship poem, Rouse Simmons, 1912. A pantoum consists of four-line stanzas in which the second and fourth lines of each stanza serve as the first and third lines of the next stanza. In this case, it gives the poem the wave-like effect intended by Hunter Morgan, as if the debris from the ship were bobbing up and down in the rolling waves. Jim Daniels is a Detroit native and professor of creative writing at Carnegie Mellon University in Pittsburgh. Daniels explained that, despite living in Pittsburgh for more than thirty years, he always returns inland to Detroit. So he titled his latest collection of poems Rowing Inland. The poems he read gave glimpses of the Metro Detroit of Daniels's youth and his relationships with his family then and today. 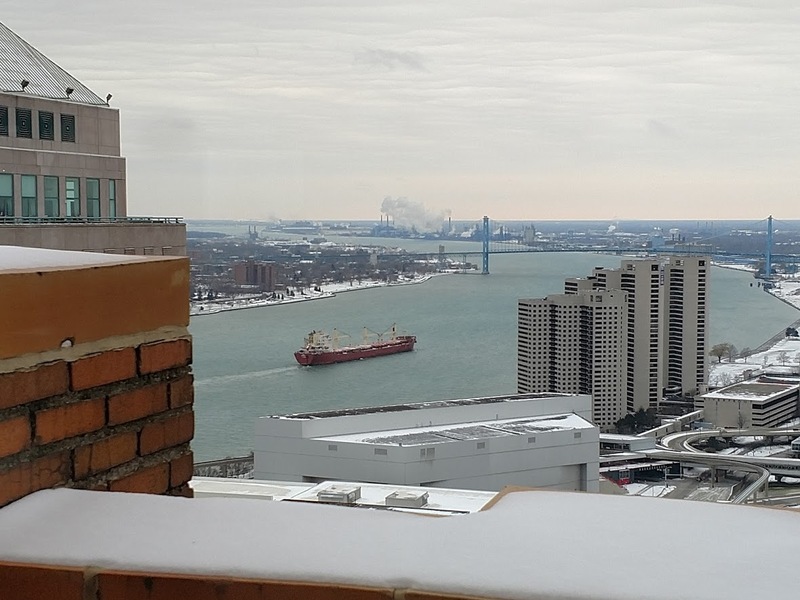 When he read about driving the gridded streets of Detroit and ending up in Canada, Daniels's personal words felt personal to me, for I know these streets and drove them aimlessly as a teenager. His poem Hard Candy is about a family secret and the hard candy his grandmother kept in a metal dish. I remembered how both my grandmothers kept dishes of hard candy, and I wondered what sorrows and secrets they kept locked away. 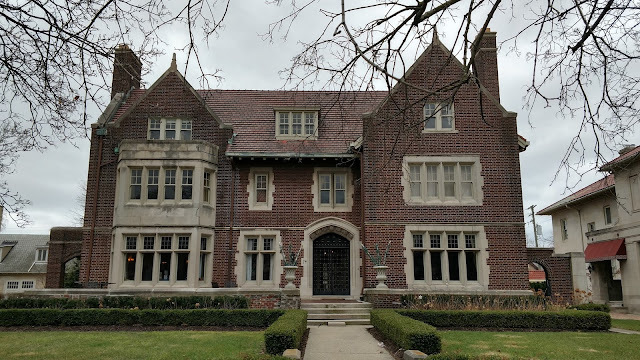 The reading was hosted at the former Kresge estate in Detroit's Arden Park neighborhood. Paddy Lynch, of the Lynch and Sons Fund for the Arts family, purchased the house in 2011 and has brought it back to its original glory. Besides the Kresges, who founded K-Mart, the house's street once was populated with famous Detroit families like the Dodges and Fishers. Despite the grandeur of the home, the event was intimate. My wife, Allison, and I were able to speak to all three poets, and we found each of them to be friendly and unpretentious, normal people with extraordinary voices. 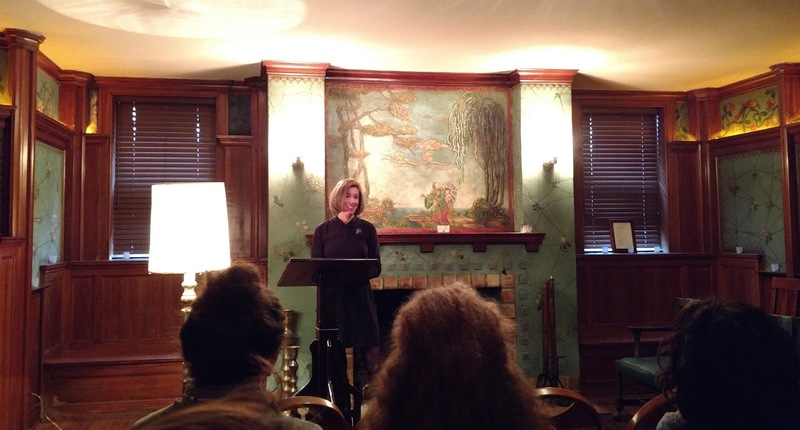 The reading itself was in a basement room adorned with artwork along the walls. The poets and speakers stood in front of a mural that Paddy said reminds him of Ezra Pound's poem The River Merchant's Wife: A Letter. Paddy read Pound's poem at the end of the night in honor of his parents, who will be celebrating their fortieth wedding anniversary this year. Thomas Lynch, Paddy's uncle and a renowned writer in his own right, spoke before the readers. He depicted the struggle for poets to find audiences (and recited the Don Marquis quote above), and discussed the importance of poetry and the arts in our fractured society. 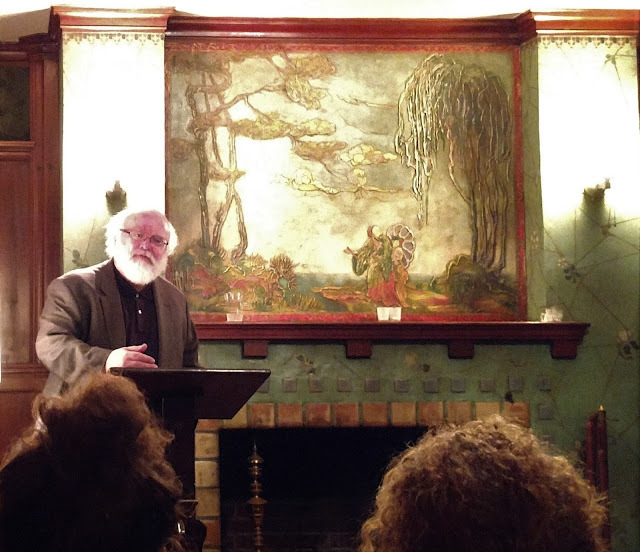 His sense of humor shone as he joked that the poetry reading was a success because the attendees outnumbered the poets. The reading was a reminder of Michigan's natural beauty and the humanity of its residents. I look forward to seeing what other writers Lynch and Sons Fund for the Arts and the Made in Michigan Writers Series will uncover. At the end of the night, I walked out of the reading with a signed copy of each poetry collection, beautiful broadsides of the poets' works by three letterpress studios, and the echoes of rose petals.